Things have been going full steam ahead with the torn paper collages……I just heard from The Chautauqua Institute in upstate New York where they have been in a show since June 23rd, and five of the nine collages have sold already. Yahoo!!! What a beautiful place Chautauqua is….a first time visit for me but I will return. 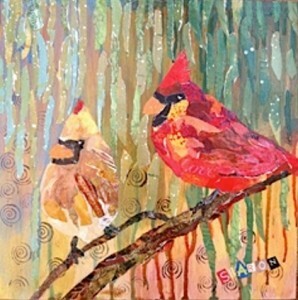 Last week I finished a commission piece for a 15th wedding anniversary…..it was 2 cardinals on a branch with lots of textured background…..the happy couple are Virginians and cardinals are their state bird. Today I was commissioned to do three collages for a friend. She has just redecorated her 3 children’s bedrooms and wants my collages for the focus walls…….yikes! Now I have to put on my creative hat and figure what will work for them. They are 8, 7 & 6 and we want to have something that will stay with them for a while. 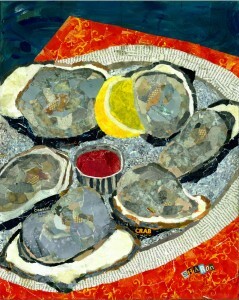 The “Salty Six” collage of oysters on the half shell sold this weekend as a birthday present for a guy who adores oysters. Hope he is surprised and loves it….Many thanks to Dottie for buying this one. Some great news! I was just invited to be one of two guest artists to participate in the annual L’Hirondelle Club Art Show in Baltimore this coming October. ……so I’d better get to the studio and start working. Yesterday I delivered a collage that was commissioned as a house-warming gift. This was especially fun to do because I was given lots of personal papers, photos, tickets, and school logos to incorporate in the piece. After they have presented it to her I will post it here on www.SharonKrulak.com and on Facebook. It is a Surprise! Many thanks to Elaine for putting this all together.